The 10 Best Mountain Biking Trails in West Virginia! Few places offer what West Virginia does when it comes to mountain biking trails. From beginners to expert and competitive riders, the Mountain State provides scenic trails that run along old fire roads, up and down railgrades, across cow pastures and meadows, take you into the woods and over the mountain. With over 88 bike trails across the state and 10 of the best featured below from which to choose, you’ll almost be in heaven. Amazing views await you as you take the North Fork Mountain Trail in Petersburg, West Virginia. This trail is a favorite among those who attempt it, and offers a lightly traveled trail labels as difficult, so may not be favorable for beginners. Riding the entire trail will take 2-3 days, depending on how often you stop, and dogs are permitted on leash for those opting to hike instead of ride. This multi-purpose recreational trail located in Harrisville, West Virginia allows all types of biking and hiking except motorized vehicles. Starting in Parkersburg and ending in Clarksburg, this Rail Trail is appropriate for all levels of skill. You’ll ride through some of the prettiest country around, including 13 tunnels, one being the legendary haunted Silver Run Tunnel where it’s said that riders can see the ghost of a young woman who died nearby. You’ll get a workout on the Seneca Creek Trail that begins at Spruce Knob, West Virginia, but you’ll be glad you traveled it. There are several connecting trails that run on the Allegheny Mountain, but most of them lead back to Spruce Knob where you can park. Fourteen miles of challenging terrain is what awaits you on this well-marked stacked loop trail. It’s recommended that you ride the trail and then ride it back to your starting point, and if you’re into climbing, bring your gear because some of the best climbing opportunities are nearby. 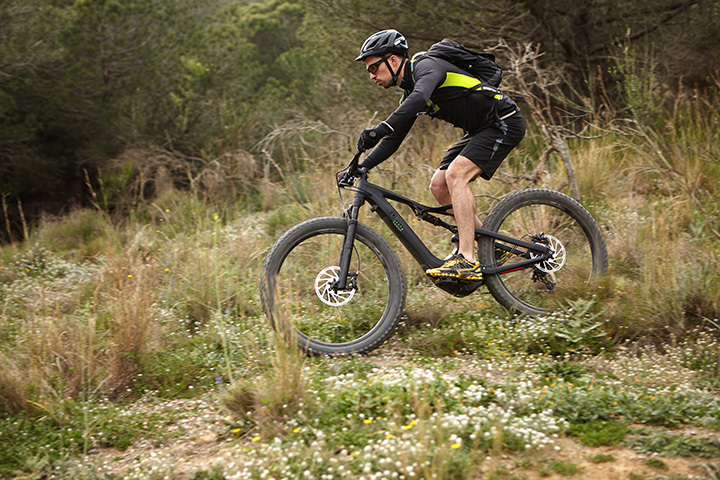 This 37-mile single-track mountain bike trail is best suited for experienced riders. The push to finish this IMBA Epic trail is hard, but well worth it as you travel from woods to rocks and the views of the Monongahela National Forest are spectacular. There are places along the way to refill your water bottles and rest up before returning to the trail. Uphill, downhill, smooth surfaces, grassy meadows, blacktop roads covered with grass, and old fire roads are what you’ll travel when you venture on the Pocahontas/Kennison/Cowpasture Loop near Richwood, West Virginia. Your starting point is at the Visitors Center at Cranberry Glades and there are signs that point that way to your trail of choice. This 19-mile trail is good for beginners, although more advanced riders will enjoy it, also. Beginners to experienced mountain bikers will find a trail just for them on one of the 40 trails customized at Snowshoe Mountain in Snowshoe, West Virginia. There are individual and group lessons available that build your skills and answers questions about this popular sport, and bike safety is always stressed. The USA Cycling Mountain Bike National Championship is held there in July and qualifications are available on the website. One of the oldest and most frequented trails in the area is the Mountwood Park Trail System that begins in Parkersburg, West Virginia. There are over 30 miles of trails that are maintained by the River Valley Mountain Bike Association, making this series of trails one of the best in the country and a popular single-track system. This five-star epic ride running alongside the Dry Fork River and beginning in Thomas, West Virginia is parallel to an old railroad track for 24 miles. Dry Fork is a tributary of the Cheat River in the Allegheny Mountains and flows through a large part of the Monongahela national Forest. Beautiful scenery, but not for the faint-hearted. Sleepy Creek South End Loop in Hedgesville, West Virginia is a great starter trail for beginners and runs for about 30 miles on an old fire road. Sleep Creek is maintained by the WV Division of Natural Resources. Features a dozen or more trails on the loop, the trail after the first couple of miles becomes more difficult with rocky paths and tree-fallen trails.